Belonging to an eminent family of famous painters who can trace back their artistic heritage to four generations, Mohi Paul was moulded by his father the renowned painter Anil Kumar Paul.- who was one of the torch bearers of Abanindranath’s ‘Bengal School of Art’. He is equally at ease both as a painter and a sculptor. In his work, Paul moves effortlessly from one medium to another; from oil to acrylic, from water to charcoal to Conte. At present he is experimenting with ‘Tempera’. His experimentation with different media echoes some of the pioneering work using opaque water colour done by his father. He absorbed western techniques while studying in college and mixed it with his innate Indianness. He uses tone wash technique of water colour— predominantly ‘graded wash’. Some of his works in our collection include ‘Bharatmata’, ‘Pururaba and Landscape’. Based on Indian mythology, his paintings are bathed in diffused light like an introvert straining against himself to shape his imagination. His characters have the soft glow of Indian classical miniatures, colours are applied robustly, with an enigmatic light that’s neither dawn nor dusk lending a certain warmth to his story telling. His art essentially is about reminiscences. His contemporary interpretation of the tale of Pururaba and Urvashi, a king so besotted with a celestial nymph that he seeks eternal youth, is tinged with melancholy. In it Pururaba is hesitant and Urvashi is self-absorbed. The backdrop of a misty green forest perhaps a throwback to faded reminiscences of eternal lives. ‘Anatomy depends on expression’— as he defines his method of sculpting. Without following any particular genre, Pradip Sur creates his own form and style. Sometimes a line in his curving speaks to you with its form. His sculptures convey speed, life, situation, thought and most strikingly underscore a social message with them. It could approach the condition of society through its qualities of size, mass, space, colour, shape, texture etc. The artist’s individuality stands out in his work even in the commissioned work, just as Rodin’s did. The artist claims, when basically he follows Ramkinkar Baij’s form and style, Auguste Rodin remains at his heart. 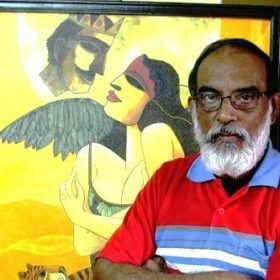 Graphic Designer by profession, Sur has executed Murals and sculptures in varied media like terra cotta, fiber glass and bronze; both indoor and outdoor, all over India for past forty years. His famous works include the logo’ of ‘Nandan’, Kolkata made of glass-fiber designed by Satyajit Roy. Sur has participated in major art exhibitions across India, including Jehangir Art Gallery, Mumbai; Venkatappa Art Gallery, Bengaluru and many others. His work is in the collection of Eastern Zone Cultural Centre, Kolkata and also been collected privately in India and abroad. One of his selected artwork, ‘Joyful Decision for New One’ depicts the disadvantages of single child in a family. Another of his sculptures ‘Struggle for Existence’ shows the importance of soil for our living. His works reveal multiplicity of meanings in very familiar forms. His carvings of ‘Unexpected Return’, ‘Instinct’, ‘Heart is Beating’, ‘Allowing to Breath’, ‘Banalakhsmi’ (the Sylvan Deity) bring out an instinctive response to the physical world and to their qualities of scale, texture, mass and echo them in sculptures of timeless theme. 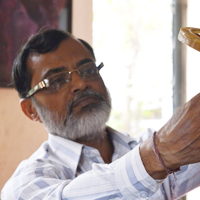 Somnath Chakraborty’s favourite sculpture material is bronze. His simple human forms, seemingly short headed, wide shouldered along with peculiarly long lower portions signify happy hearts who are always full of positive energy. The artist tries to capture glimpses of his surroundings through his imaginative forms. These forms possess their unique other-worldly countenance but connect to the pure emotions of our existential lives. Our collections contains some of his noteworthy works. His ‘Pride’ essays the reassurance of the new environment of women empowerment in rural India. The village folk woman on cycle, her elegantly dignified body language rather her nonchalant gesture acquaint us with her self confidence and the artist’s mastery in this field. ‘She’ articulates the same theme of ‘Pride’, established in urban culture through fashion parade. ‘Kolkata’ portrays the social imparity that the viewer recognizes by the juxtaposing body shape of the rider and the puller of rickshaw. Romance emerges from the situation of ‘Under the Umbrella’ where in a rainy evening the young lovers get the chance to come close and feel the magic of sensual desire. Each work of Chakraborty successfully tells such stories or ideas behind it. 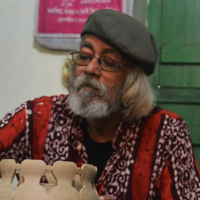 Chakraborty’s influences include Sculptor Debabrata Chakraborty and Auguste Rodin remain his favourite. He had his Solo Exhibitions at Academy of Fine Arts, Kolkata and at Jehangir Art Gallery, Mumbai. Apart from this, he participated in many Group Shows all over India and his artwork has been a part of many prestigious collections. Subrata Paul’s favoured materials are bronze embellished with wood. His signature fusion of the two different materials with his stitching style permits lends a unique texture to his sculptures. Our collection, includes some of his remarkable creations including “Fish”, “Goat” and “Bull”.Paul’s ‘Fish’ represents contrasting characteristics. The Buddha like drooping eyes of the ‘Fish’ is contrasted paradoxically against the frenzied fins, reminding us of Medusa’s dishevelled hair. Calmness and restlessness in one form, the ‘Fish’ resembles the life force.It is a metaphor for the inner human strength to swim against the tide of adversities. His ‘The King’ represents an imperial image. The statute is looking towards heaven, as if seeking some inspiration to perform his royal duties. His crown is like a crown of thorns. It is not a pleasant task but it has to be performed. His attire declares he has to modify his own life into the straightjacket of his royal duties. Sepia dream worlds populated by clowns, floating figures and strange humanoid creatures-Dipankar Mukherjee’s paintings inhabit a shadowy world of romance and desire, promise and despair. He is very much a detached observer though in some paintings the painter appears as a hovering figure who defies gravity. Smiling clowns and dreaming some larger than life women frequently appear is paintings while his male protagonists –represented as pensive avian creatures appear somehow thwarted. The fields of lotus in some of his paintings is perhaps a metaphor for richer fulfilling relationships which have somehow evaded his protagonists. There’s an overpowering sense of melancholy showing the limitations of real lives. 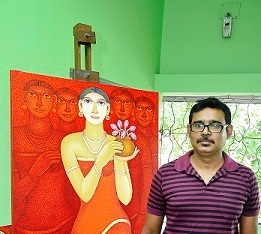 Dipankar Mukherjee is a self-taught painter. He has been inspired by the works of the famous Dharma Narayan Dasgupta, Ganesh Pyne and Marc Chagall. Mukherjee mirrors Chagall’s style of flying characters in his canvas. It will not be out of context to mention that he is a follower of Ganesh Pyne which is reflected especially in his treatment of eyes. His favourite mediums are acrylic, gouache and black & white pencil drawings. His paintings were exhibited at multiple art galleries including Habitat Centre-New Delhi, Jehangir Art Gallery, Mumbai. His work is in the collection of ‘Karnataka Chitrakala Parishath’, Bengaluru. Our collection has a selection of some of his acclaimed paintings, including ‘After the Last Curtain’ series, ‘Dream on Lotus Garden’, ‘Angel in Lotus Garden’. Animesh Biswas’s canvas is one of modest colour, soft line, simple composition and decorative texture with striking human characters. His big eyed depiction of Lord Krishna in “melodious”in faux Kalighat style is a progression from Jamini Roy and the colours remind us of Ramananda Bandopapdhyay.The focused Krishna is the subject and the blurred ‘gopis’ are used as background. Totally absorbed in the flute recital, the characters of the painting transport the viewer into the world of exotic ‘Brindavan’. Another painting of his, ‘Rendezvous IV’ explores the abiding relationship between man and woman. Here also, remarkable use of red in different hues is one of the pervading and permeating characteristics of the painting. The highlighted yellow colour on the head and the metallic effect of ribbon on braid celebrate the drama in a riot of colours. The central character is a maiden submerged in the thought of her imaginary beloved. In a dusky afternoon, after her regular evening toilette, she looks at the sky from where the cherished one is also watching her. 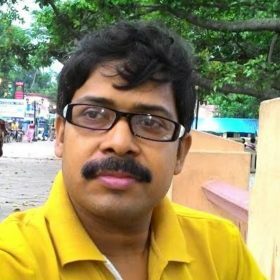 Animesh has made a name for himself in a short span of time. His paintingshave found buyers in India and abroad. His work has been displayed in galleries, collections and art museums in India, USA, Switzerland, Singapore, and Dubai. 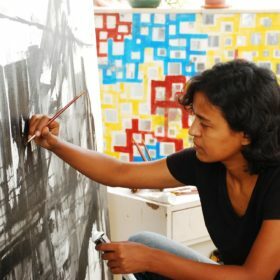 One of India’s younger generation of artists, Tanushree Ghosh’s favourite media is water colour. Her paintings are resonant with an intensely personal interpretation of Indian mythology with a exploration of divinity means. Her work have exhibited all over India including Jehangir Art Gallery-Mumbai, Lalit Kala Academy-Delhi and in the U.S.A. He style could be described as a mélange of Bengal school of art with a knack for dramatic storytelling. Much of her work is preoccupied with the idea of Shakti- the mother Goddess. The revered Devi form of hers is the ultimate Divine female power, capable of destroying every evil and every wrong nurturing good and sustaining life in whichever form it exists. Her paintings are a quest for the ‘Devi’-Goddess in every women- tribute to their innate creativity, passion and self-knowledge and power. Our collection include her ‘Play with Dark’ series which convey the role of women leading to light out of darkness. Instead of the foggy water colour wash technique of the Bengal school Tanushree takes recourse to a water colour tone wash in variegated form which brings out her individual style and texture. Vibrating colour, rhythm, lively swing of brush strokes celebrate the feminine face of God. Contour, body language, story transcend the viewers above the real world. Surrealistic approach on women empowerment gives a new dimension to her paintings. Viewers of Ghosh’s early paintings regarded her as an exciting story teller whose appeal was enhanced by the setting of Indian mythology. Certainly, these elements were strong in her early work but now her enthusiasm of the mythological setting has morphed into an exploration of woman’s identity and empowerment. 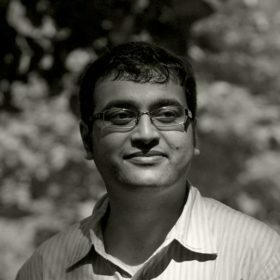 One of our featured artists with the AA Gallery is acclaimed photo journalist- Sunil Kumar Dutt. Well known as the photo chronicler of Saint Teresa’s (Mother Teresa) life and work Dutt is also famous for his vignettes of Kolkata life. Some of his well-known photos on Saint Teresa are part of Malcom Muggeridge’s “SOMETHING BEAUTIFUL FOR GOD” (Harper Collins, London) and his book “Mother Teresa-down memory lane”. His other famous works include “Kolkata Canvas”, “Shantiniketan” and “Durga Puja”. • Christopher Award from New York. From real to unreal, formation to dissolution his painting lets us hover our feeling into the realm of metaphysical abstraction. Nripen Nath thoroughly simplified the aspects of his paintings to reflect his inner vision done. His canvas underlies the visible world which generates a distinct, universal aesthetic language within. Reminiscing the objects from old Kolkata and other cities he forms his shapes through lines and palette and with the use of asymmetrical balance between past and present, figure and colour. Nath’s ‘The Houseboat’ reflects the turmoil in Kashmir. The lake, the houseboats, the city convey the influence of various art movements such as ‘impressionism’, ‘futurism’ and most importantly ‘cubism’. Radiant reds, blues, whites are thickly applied through acrylic medium on canvas. The effect carries the viewer beyond the woebegone reality to pure abstract design. ‘The Red Bridge’ is another colourful stylization of realistic recollection into a mindful illustration of abstracted form. Its colour, light and shade and brushwork make the viewer excited to feel the drama and the rhythm of the painting. ‘The Old City’ depicts the same methodical procreation of his artistry of presenting the past via the present reaction of mind. One of old Kolkata’s very known place experiences the freedom of universal appeal in accordance with his unique style. It makes us like known face in unknown lane. Nripen Nath admires the style of Ganesh Pyne (1937–2013), Jogen Choudhury (1939-) and Rembrandt(1606-1669) but does not confine himself to any particular genre. Like the famous artist Picasso (1881-1973), he breaks his artistic expression regarding form and style again and again. He takes risks and paints, his creative nature always seeking something new from him. In his own words, he paints entirely for his own satisfaction. Nath’s paintings are displayed in various exhibitions all over India. Apart from that his paintings are in collection of many aesthetes. 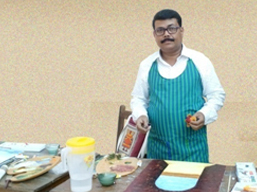 Ajoy Das is a well-known name in Kolkata’s art world who is equally adept in painting and sculpture. His recent sculptures in bronze medium, have been highly acclaimed by connoisseur and the famous painter Ganesh Haloi (1936-) is one of them. In painting, his favourite media are watercolour and oil painting. In the field of painting his teachers Ganesh Haloi and Satyen Ghoshalare his sources of inspiration. In sculpting, Debi Prasad Roychoudhury(1899-1975) and Rodin(1840-1917). This devotee of art keeps very low profile, staying close to the studio and far from the limelight, believes his work is his identity. We have in our collection some of his notable works including the sculpture of an owl- named as ‘Bahon”(Vehicle).. Owl is the vehicle of Goddess Laxmi, the Hindu Goddess of wealth, fortune and prosperity whereas throughout the Western World owl has been used as the symbol of knowledge and wisdom, and accompanies Athena, the virgin Goddess of wisdom. The artist represents financial prosperity through it. Das’s Owl also addresses the airy designs of ‘alpana’, a type of folk art often found in the floors in homes in eastern India and particularly in Bengals. Another one, ‘Aporanhe’(In the Twilight) captures a particular time of nature as well as a particular time of age in human life. It is the time to cross the bar of the light and enter into the dark. In human life the time symbolizes crossing the bar between life and death. The artwork enthralls us by its serenity and the beauty around it. The golden green tint reminds us the remaining ray of the day. The curly tree provides a resting place and the serenity of jungle life gradually hypnotizing us before surpassing to the infinity. 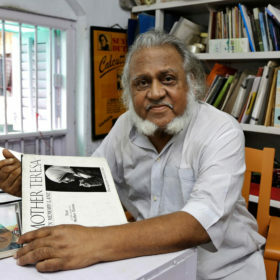 Forty years in this sphere, Ajoy Das has exhibited all over India. His work has also been collected privately in India and abroad. 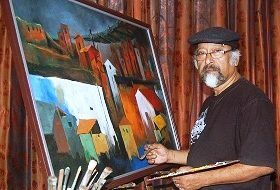 Joydeep Chatterjee’s brush is easygoing withhis favoured media of acrylic and watercolour. His treatment of watercolour has its own accidental characters which create unknown abstract forms. Joydeep tries to capture the ephemeral moment in his portraits with the help of his spontaneous watercolour treatment. Being impulsive, always in pursuit of the hidden spirit of theinner self, he intentionally plays with those accidental watercolour characters and treat them to form the shape of a portrait or figure consciously. His restless but deft strokes are predominantly dominated by the shades of white, green, yellow and red. To develop the pictorial quality, he puts some lines of glass marking pencil for separating the different surfaces which helps him to break the realistic forms, and to some extent, provide abstraction from different perspectives. Our collection has paintings from his ‘With the Surface’ series. Some elements like butterfly, flower, vegetation add nature to the human psyche in his canvas. In this respect, Chatterjee thinks watercolour is more subjective than acrylic and oil. As a student of western slyle painting, he is greatly influenced by ‘Impressionist’,‘Expressionist’ and ‘Conceptual’ art movements. Paul Cézanne(1839 – 1906), Van Gogh( 1853 – 1890) are his favourites. 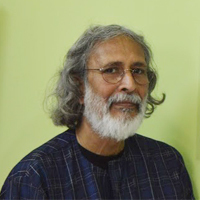 Among Indian painters he admires Bikash Bhattacharjee(1940 – 2006) andAtul Dodiya (1959-). 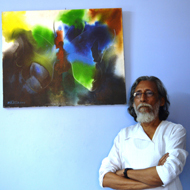 Besides solo exhibitions inFaridpur,Bangladesh; Academy of Fine Arts, Kolkata and Jehangir Art Gallery,Mumbai, his work remains in the private collection of a number of art lovers throughout India and of several places in America and Germany.Apart from this he has participated in many group shows and art camps all over India. Malay Dutta characterizes his painting as Indian style in surrealistic format. Immense tranquility, profound spirituality, boundless freedom envelop the viewer who finds all these in his canvas. In quest for peace he has sorted his artistic space with the gem of sacred utterance: ‘Buddam Saranam Gacchami’. In this present agitated and peaceless worldly situation he seeks his refuge to Gautam Buddha. Each of his artwork bears the message of peace. He delineates his narrative in a simple way as it can touch the heart of general people easily. To make his painting unique, he assimilates man, nature, and peace in a single frame. His favourite colours are green, blue and red which he uses in his preoccupation with the background texture. Inspired by his contemporary artist Sanatan Dinda’s (1971-) Buddha paintings he articulates his own genre in a different dimension with the same object. 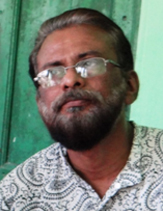 Both Bikash bhattacharjee’s (1940 – 2006) subjective guts and Shahabuddin’s (1950-)powerful dynamism have great impact on him. In Europe, Leonardo Da Vinci(1452 -1519))as well as Pablo Picasso(1881 – 1973) persists as his favourites. Our gallery is adorned with some his exclusive paintings from ‘In Search of Peace’ series. The prime essence of these paintings is the representation of Buddha amidst various aspects of nature. Floral and leafy decorative texture in backdrops with white dove, white hibiscus, pink lotus are fairly associated with the differently posed Buddhas. Apart from Buddha, an Indian ‘local violin’ player occupies his mind in one of his paintings. His peaceful absorption in music is expounding in his perfect posture. The viewers can relate the serene feeling they have procured from the painting. 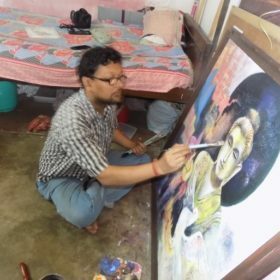 Besides solo exhibitions at Indusind Bank Art Gallery (Chandigarh), Academy of Fine Arts, Kolkata, Gallery Art Portfolio (Chandigarh), Dutta has participated in several workshops and exhibitions all over India. His paintings have been taken into private collection in Kolkata, Delhi, Mumbai, Chandigarh and abroad. 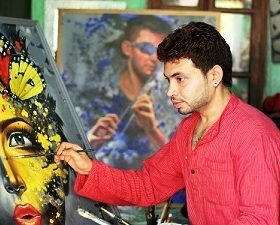 Srimanta Das is a young aspiring artist who specializes in face paintingswhich are steeped in photo-realism. His face paintings convey many moods and many stories. One can feel the inner persona vividly etched in the outer visual self of his faces. His palette is inclined towards the darker shades – stark shades of red, blue along with grey and black embroider his canvas. His favoured medium is acrylic and oil. As an expert craftsman both in oil and acrylic sometimes he exercises both in one canvas offering acrylic as background colour and oil for the object. Das has an eclectic taste when it comes to his favourite painters and the list includes a very diverse bunch in Salvador Dali (1904-1989), Rembrandt (1606-1669), Bikash Bhattacharjee (1940-2006), Raja Ravi Varma (1848-1906) and Sanjay Bhattacharya (1958- ). Retaining a feeling of Indian connection, the texture and decoration of his artwork show his skill in naturalistic design. In this connection, sometimes he uses ‘Lotus’, the national flower of India which is practicing from the ancient days as a flower of ornamentation. We notice its enormous usage in Ajanta and Ellora cave paintings. Sometimes it turns into ‘butterfly’, symbolizing togetherness and love and another time the feather of peacock, the national bird of India and the favourite decor of Lord Krishna. His paintings included in our collection includes ‘flying dream’, ‘Sringer’ and ‘Waiting for Someone’. The painting ‘Sringer’ (adornment) depicts expectation and desire as a lover waits. ‘Flying Dream’ catches a fleeting moment where some unattainable dream is finally within reach.His ‘Waiting for Someone’ with its indeterminate look traces that unknown feeling which is gnawing inside but cannot be expressed in words. Das has participated in many national and international shows and his number of work have thus found its space in many noteworthy art lovers’ private collections in India and abroad. “The print is unique among artistic media. The wide range of materials and diversity of techniques associated with printmaking make it a particularly flexible and resourceful medium, offering the artist many varied possibilities for experiment and expression.” Indian artist Sudip Saha’s innovative exploration of various media including linocut, woodcut, unocut, and many others also offer the artist as well as the viewers a unique aesthetic appeal which only the print making media can give. His black and white scenes and compositions echo earlier explorations in charcoal by Nandalal Bose (1882-1966) — one of the doyens of Bengal School of Painting. German artist Cartin G Grosse (1964-), Indian artists Haren Das (1921-1993), Chittaprosad Bhattacharya (1915-1978), MukulDey (1895-1989), RamkinkarBaij(1906-1980) — the talented practitioners of this field are his favourites. According to his own words, his students are also his inspiration to find a new subject for his new composition. His compositions are mainly two dimensional and predominated by black and white print. To match the rhythm of subject with figurative elements he uses colours sparingly. ‘Patachitras’ (scroll painting) of India, Picasso’s cubism, geometrical shapes and myriad dance forms provide him with his artistic inspiration. His professional experience in different media manifests in a vigorous revival of the graphic arts. He is one of the very few artists of print making in India who is capable of grabbing the attention of the viewer via his dramatic magic of graphic lines. Sahahas spent many successful years in this field. His artwork has been collected privately across the world.Besides, he has participated many group shows and art camps all over India. 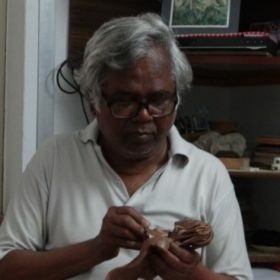 So successful is he that from 1991 until now all the leading newspapers from Kolkata and art journals throughout India, for example ‘The Telegraph’, ‘AnandabazarPatrika’, ‘The Statesman’, ‘The Asian Age’, ‘The Hindustan Times’, ‘The Art India’ and others— have acclaimed his craftsmanship through the medium of ‘collage’. His love of collage was pure coincidence. To restore one of his water colour paintings he harboured the collage technique and fell in love with the medium. Working in this rare art form with accolade for more than 29 years, he gives it a new dimension. It won’t be an exaggeration to say that he is the compiler of the grammar of his own style of form/genre. Different types of paper cutting with captivating colours and designs among which his thoughts find their dimension to choose a fine design, a logic which certainly supports the whole action. All are retaining for a wonderful artwork as the papers he sets to depict his flowing naturalistic style. Sometimes a design in paper energizes his formative thought and then he channelizes it along his action of collecting designs and well-chosen coloured papersfor shaping the idea. Often, his thought comes first then the collection. The pattern has unlimited abstractions as such; he uses a leg covered in trousers as the trunk of an elephant, an advertising paper of a leather bag as an iron masked face, the top view of a motorcycle as the tongue of Hindu Goddess ‘Kalika’ and so on . He collects his subjects from things around us. 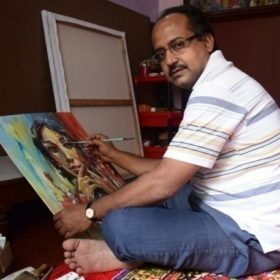 His work demonstrates dilapidated old buildings of North Kolkata, alleys and lanes and very often myriads of human emotions are found on faces. Historical places also get very focused in his compositions. Pillar, arch, light and shade attract him very much. Yellow and brown are his favourites and he treats them respectively for light and shade. To compile an accurate effect he produces the rich and subtle palette which most of his own artwork demands . Our gallery gets the chance to offer some of his wonderful compositions from his ‘Heritage’ and ‘Nostalgia’ series. Apart from these, ‘Incognito’, from one of his other creations that our gallery offers, achieves its highest point of aesthetic value through its medium, style and colour. By setting up fragment of papers on wet layered glass fibre, Denra has made this fascinating collage under the name of ‘Incognito’, what is admittedly noteworthy . Many famous persons like Lady Ranu Mukherjee, KabirSuman admired his work exceptionally; and his work is among private collection of various art lovers from India, Nepal, Germany, Switzerland, Canada, USA and UK. Excepting from solo exhibitions in prestigious art galleries all over India, he has participated numerous group shows in India and overseas. According to his own words, whatever he has experimented till now, his artistic self is rooted in ‘Jorasanko’, the birthplace of Rabindranath Tagore (1861-1941). While his dreams veers towards the archetypal renaissance artistMichealangelo (1475-1564), he also seeks his inspiration from Rabindranath. His powerful selection of subjects and vigorous intensity of papers are so appealing that is composition has brought dignity to itself by a subtle kind of thought provoking sensitivity. He is acknowledged to be the most influential figure in the modern era of decorative arts in Bengal. Now he is venturing his artistic genius in the medium of acrylic painting. We wish he will spend more time with this artistic form and that he will produce more aesthetic compositions for us. Sushanta Roy is fascinated by the artistic possibilities of objects from our everyday life. For example, Roy explains the possibilities presented by an umbrella. Apart from its conventional use, we can use it as a stick and a stick can further be used as a conductor’s baton or as a weapon. To make his subject more dynamic and more effective he frequentlytransmutes one object to another. His imagination blends a microphone with a tree, a train with a blind beggar’s song, a frame of spectacles with a‘Sarod’ (a stringed Indian instrument),a pressure cooker withhuman figure and many others. The artist likes the form breaking perception of Pablo Picasso (1881-1973), the draughtmanship of Henri Matisse (1869-1954) and Van Gogh’s (1853-1890) spiral brush strokes. The great renaissance artists Michelangelo (b.1475-d.1564) and Leonardo Da Vinci (1452-1519) are also among his favourites. He draws his inspiration from Indian stalwarts like Abanindranath Tagore (1881-1951), Ramkinkar Baij (1906-1980), Paritosh Sen (1918-2008), Maqbool Fida Hussain (1915-2011), and Ganesh Pyne (1937-2013).The traditional “Pot”style of Kalighat along with the other folk painting forms have a great influence on Roy’s creation. He prefers the pointillism technique of applying small, distinct dots of colour to shape an image. Shades of blue, black, white, red and yellow govern his palette. His otherwise muted coloured palette is brightened up by the occasional yellow in the form golden dots. Without struggle we can’t realize the value of life. Likewise, he creates shades in his painting through acrylic medium to expose the magic of light. Our gallery includes his creations such as ‘Butterfly’, ‘Childhood’ and ‘Nature ’. His ‘Butterfly’ conveys the beauty of nature while ‘Nature’ symbolizes the beauty of mind through the tree which is deftly combined with a microphone. His ‘Childhood’ memory triggering objects like a slingshot, paper boat and a kite bathed in a blue dream like light. Roy has participated many group shows and art camps all over India and his artwork has been collected privately in India and abroad. 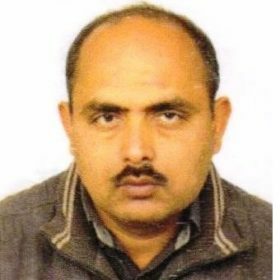 Bibhuti Nath Jha, hails from one of the most distinguished folk painting family of Madhubani-Bihar, India. Sri.Jha is a self taught folk artist with inborn skills that have been passed through centuries from generation to generations. 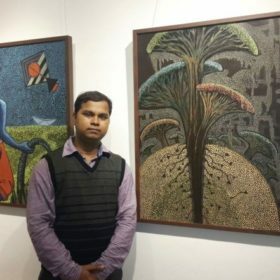 He is mainly focused with intricate and fine work with mythological as well as other typical subjects of Madhubani, also known as Maithili folk art. He creates his painting mostly with bamboo made nib-pens and matchsticks using lampblack , natural dyes and pigments and concentrates mostly on black and natural combinations. His paintings are characterized by their eye-catching geometrical patterns. 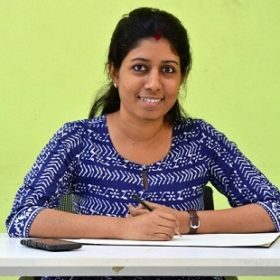 Sri Jha is easy going to all the five distinctive styles of Madhubani painting , namely, Bharni, Katchni, Tantrik, godna and kohbar and is highly conversant with all kind of surfaces eg. cloth, handmade paper and canvas. Sri Jha and his work first came into lime light in Mahalaxmi SARAS 2005 organised jointly by Ministry of Rural Development- Govt. of India & Rural Development Dept., Govt. of Maharastra. In the same year he enthralled the viewers with his astonishing craft works in Madhubani Folk Art in SURAJKUND Handicrafts Expo Fair 05 jointly organized by Haryana Tourism & Ministry of Textiles, Govt. of India. Abundant art gallery is proud to have the superb collections of Madhubani painting of Sri Bibhuti Bhusan Jha. 3. Kokuyo Camlin Best Entry(Western India), Mumbai.2012. We have added Bivas Bhattacharjee’s widely acclaimed work “Velocity of Darkness” to our collection. Velocity with its sometimes disturbing images is an exploration of hidden emotions lurking beneath the façade of civilisation. As his subjects Bivas has chosen real people eking out an existence on the edges of light and darkness in the urban sprawl of Kolkata. In one sense its also an indictment of the model of economic development which pushes so many people to the periphery. The son of famous Indian painter Bikas Bhattacharjee, Bivas is a professional photographer trained in University college Falmouth, UK. His work has been recognised by Prix De La Photographic, Paris and Tokyo International Foto Awards among others. His work has been exhibited widely in India and abroad.